WE HAVE MOVED!!! from our old dive centre at the Coralia Hotel. 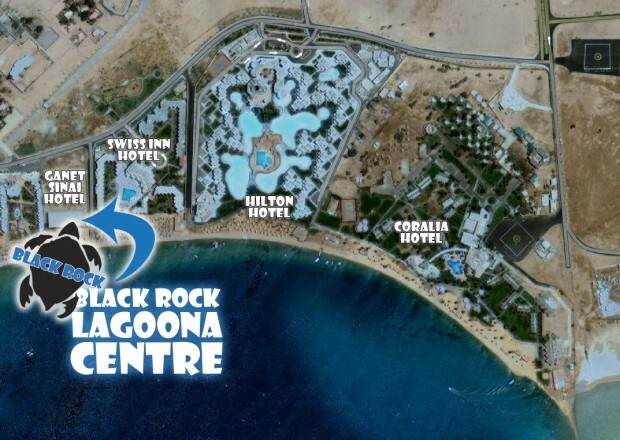 Our new Lagoona Dive Centre is a PADI Five Star IDC Centre and is situated within the grounds of the Ganet Sinai Hotel. Nestled in the middle of the lagoon area of Dahab it is easy walking distance from all the hotels in the bay- Coralia, Hilton, Swiss Inn, Panda and Iberotel Dahabeya. If your accommodation is further a field then we will provide a complimentary taxi to and from the dive centre. Located right on the beach, we are fortunate to have a confined water area that is packed with colourful corals and an array of marine life. Facilities next door to the dive centre include a windsurfing centre, food & drink bar and sun loungers which overall add to the relaxing and welcoming atmosphere…plus when your day is done you’re never too far from a cold beer! All prices are in Euros and Equipment, manuals and certification are included in all courses and guided diving (excluding Go Pro courses) unless stated otherwise. Black Rock Dive Centre reserve the right to alter prices as and when required. 10% discount on guided diving for divers with their own equipment. A check dive on your first day is mandatory. If you have not dived for more than 12 months then a Scuba Review is required. Please note: dive packages cannot be shared.